 Welcome to Evanston and Chicago! The LoopFest conference will be held in Evanston, IL, right outside Chicago, from May 12-14, 2011. Loopfest X is dedicated to the memory of our friend and colleague Ulrich Baur. 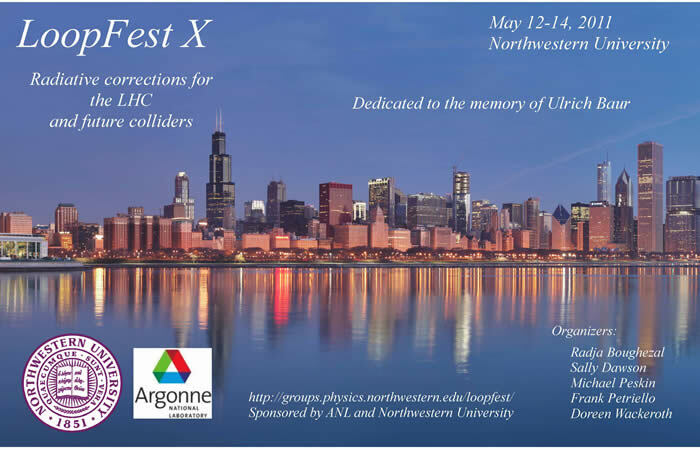 LoopFest X is sponsored jointly by Northwestern University and the High Energy Physics division of Argonne National Laboratory. Meeting location: the Hilton Garden Inn in Evanston, IL. A Google map showing the hotel location is provided here. Participants may now register on-line! The conference banquet will be held May 13 at Pensiero Ristorante. Dinner will begin at 6:30 PM. Walking directions form the conference site to the restuarant are given here.